Businesses that want to generate leads online should focus on making their websites a top destination for information with custom content. People use search engines and social channels to learn about items before purchasing, whether they’re shopping for themselves or their businesses. The same behavioral patterns apply to individual consumers. At ClickZ Live San Francisco, Google Analytics Advocate Adam Singer said the average person consults 10.4 sources before finally making a purchase. This generally spans channels, is sparked by in-store visits and revisited with email messages, and continued across search and business websites. When companies have brand content across channels to inform prospects’ purchase decisions, they can influence that interest and point customers toward solutions. A lot of businesses say they use content, but don’t have the breadth of assets they need to satisfy consumers’ hunger for information. More customers are looking for self-service experiences (in some cases, from start to finish). 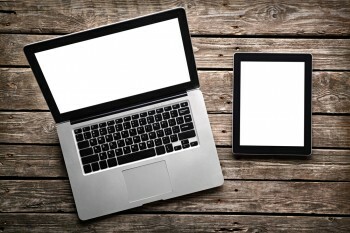 The majority of buyers surveyed (31 percent) said they want to research and buy online unassisted, with the option to receive phone support if any issues arise. 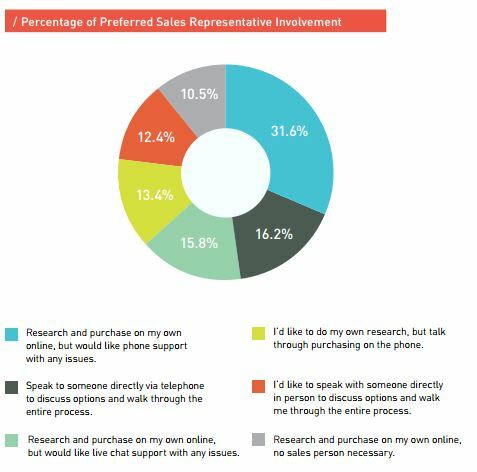 A full 10.5 percent said they want to complete the process entirely on their own with no sales assistance, while 12.5 percent said they still want someone to walk them through the process directly. Depending on the industry, the size of the investment and the nature of the purchase, buyers might be more or less willing to complete transactions autonomously. However, marketers are smart to build digital content archives that can educate leads throughout the sales funnel to accommodate individual purchase preferences. Digital content IS becoming a deal breaker for consumers (especially younger buyers) who are looking for information online. Companies that aren’t there with answers to prospects’ questions will fall off the radar, while brands that anticipate questions and provide useful resources will win brand awareness and, eventually, conversions.